Be the first to share your favorite memory, photo or story of Avis . This memorial page is dedicated for family, friends and future generations to celebrate the life of their loved one. 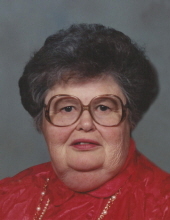 Avis Vierhuf, age 85 of Hendricks, MN passed away on Friday, March 29, 2019 at the Hendricks Nursing Home. Funeral service will be 11:00am on Monday, April 8th at Trinity Lutheran Church in Hendricks. Visitation will be 3 to 5pm on Sunday, April 7th at the Houseman Funeral Home-Birk Chapel in Hendricks with a 5pm prayer service. Visitation will resume one hour prior to the service at the church. Burial will take place at the Hendricks City Cemetery. Houseman Funeral Home is entrusted with the arrangements. Avis Marie Vierhuf was born August 13, 1933 at White, SD, the daughter of Henry Jay and Sadie (DeVries) Lambertus. She was baptized in October of 1933 and confirmed in 1947 at Zion Lutheran Church in White, SD. She graduated from White High School in 1952 and continued her education for teaching at Madison, SD. She then taught school for two years at Argo 26, then South of Aurora for 4 years, and finished her teaching career at the school in the valley at the age of 29. She also taught pre-school Sunday school at Calvary for several years. On November 18, 1956 she was united in marriage to Herbert William Vierhuf at Trinity Evangelical Lutheran Church. They were blessed to be able to adopt two children. In July of 1962, they welcomed a daughter, Dawn Elizabeth born April 18, 1962. In December of 1964, they were blessed with a son, Todd Alan born February 10, 1964. Avis enjoyed raising her children and helping on the farm. She also spent several years as a Home Interior Consultant and held Home Décor parties in many towns across the area. Later she demoed for Hy-Vee and Economart in Marshall and Brookings. She met many friends and enjoyed the socializing while working. She loved sewing, cooking, talking on the phone to the party line gang and gardening. Avis loved to shop. The highlight of the summer was when Avis and her sister Delores would take their children crazy days shopping. Family was very important to her, she never missed any weddings, anniversaries or birthday parties for any of her relatives. She also made sure to attend any events for her children and grandchildren for as long as she was able. The great-grandchildren were a special joy in her later years. Avis is survived by one brother, Wayne (Betty) Lambertus of White, SD; daughter, Dawn (Tony) Groskreutz of Minnetrista, MN; son, Todd (Deborah) Vierhuf of Hendricks, MN; grandchildren: Samuel and Nicole Groskreutz of Minnetrista, MN; Joshua (Samantha) Vierhuf of Hendricks, MN; Jacob (Kayla) Vierhuf of Hendricks, MN; Kacie (Christian) Pistorius of Ivanhoe, MN; Dylan Vierhuf of Hartford, SD; and Trace Vierhuf of Hendricks, MN; and great-grandchildren: Grace, Kole, Blisse, Jaxton, Zane, Trinity, Brooklyn and William. Avis was preceded in death by her loving husband, Herbert; parents, Henry and Sadie Lambertus; sister, Delores (Eugene) Vizecky; sisters-in-law: Ruth (Elvin) Hansen, Edith (Alvin) Wright, Fern (Clifford) Levitt and Janet (Possail) Lambertus; and one nephew, Andrew Lambertus. Avis was a loving wife, mother, grandmother and great-grandmother. Blessed be her memory. To plant a tree in memory of Avis M. Vierhuf, please visit our Tribute Store. Visitation will be 3 to 5pm on Sunday, April 7th at the Houseman Funeral Home-Birk Chapel in Hendricks with a 5pm prayer service. Visitation will resume one hour prior to the service at the church. "Email Address" would like to share the life celebration of Avis M. Vierhuf. Click on the "link" to go to share a favorite memory or leave a condolence message for the family.